9NEWS Tom Green anchor reflects on the extraordinary life of Irv Brown. DENVER — University of Colorado baseball coach, collegiate referee and longtime media personality Irv Brown passed away early Sunday morning from complications due to a brief illness at 83 years old. Brown died in hospice in Denver due to an aggressive form of lymphoma. His oldest son and current assistant coach at Auburn said, "The biggest and best thing growing up was that I never had to go outside my home for a hero or a role model. All I had to do was look at my dad every day." Over a nine-year span with the Buffaloes' as the head coach, Colorado was 224-158-2 in 384 games, the second-most by a coach in the school's baseball history. Irv had a stellar winning percentage (.586), the second-best by any head coach for 48 or more games and his last eight season's with the team all had winning records. Many of the former athletes to play under Irv went on to have great careers including catcher John Stearns and pitcher Jay Howell who played in a combined 26 seasons in the major leagues. The historic head coach was also a well-respected basketball official for 12 seasons in the NCAA, including six Final Four match-ups, before turning his sights to broadcast. Another Colorado Buffaloes alumni, Dave Logan wanted to play for Coach Brown during his time in athletics for the Buffaloes. Logan, a former CU football and basketball star from 1972-76 and now Denver Broncos broadcaster and high school football coach for the Cherry Creek Bruins was approved to play baseball by then Colorado football head coach Eddie Crowder. However, Logan never got to play for Irv because succeeding coach Bill Mallory wanted Logan in spring football practices. The two remained in contact despite never sharing a coach-player relationship. "Irv asked me what I was going to do, and I was choosing between going to camp with the (Seattle) Seahawks or a couple of business ventures," Logan said. "He invited me to come out and do a Super Bowl preview show with him. I didn't know what that really was and asked him...he just deadpanned me and sarcastically said, 'It's a Super Bowl preview show. We're going to talk about the Super Bowl.' He was kind and didn't follow that with a "Well, duh.' That was January 1985." "We laughed because even though management like me, I didn't get paid," Logan said. "But that eventually led to me entering the radio business and I was soon doing five hours a day, with Irv and Joe Williams and Irv got me a $1,000 month. That's how my now 30-plus year career in broadcasting started, and I owe it all to Irv. We stayed together a long time, and even when he left to go to another station, we were friendly competitors and still did some TV games together." 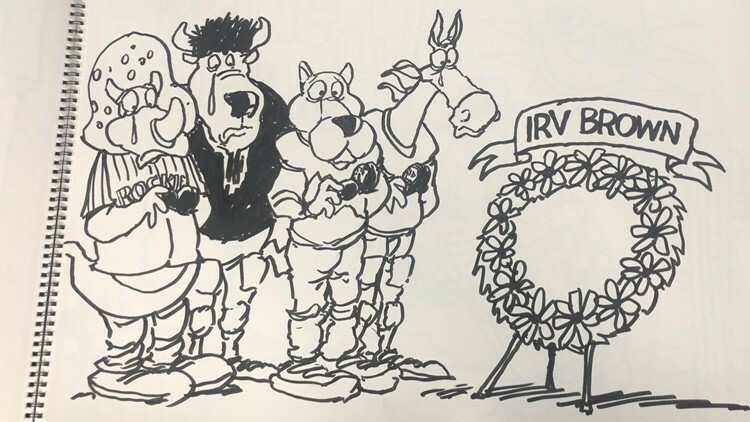 9NEWS Cartoonist Drew Litton remembered Colorado sports icon Irv Brown who passed away early Sunday morning. Irv was one of four at the fore front of Denver sports talk radio when it took off in the mid-1980's (Irv Brown, Woody Paige, Dave Logan, and Jerry Gross). Born in Denver, graduated from Denver North High School in 1953 and former head coach of Arvada High School and Metro State College's baseball programs, Irv was Colorado through-and-through. He was inducted into the Colorado Sports Hall of Fame in 1997, and served for over two decades on its selection committee. He is survived by his wife of 62 years, Pat; three children, Greg, Mike and Casey, as well as his seven grandchildren and five great-grandchildren.